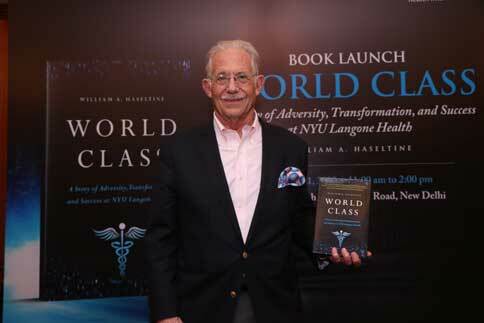 New Delhi: ACCESS Health International launched a new bestseller authored by Dr. William Haseltine, Chair and President of ACCESS Health International, “World Class”: A Story of Adversity, Transformation, and Success at NYU Langone Health. The book tells the remarkable story of an underperforming New York City medical center that was transformed into a world class, patient centered institution that now delivers clinical excellence, produces outstanding research, and offers free education to medical students. Ten years ago, NYU Langone Health was losing tens of millions of dollars and ranked in the bottom third of academic medical center hospitals for quality and safety. Now, NYU Langone Health is ranked as the number three medical school in the United States, just behind Harvard and Johns Hopkins. NYU Langone Health also moved from the bottom third in national quality and safety rankings to regularly ranking number one or two in the country, all while reducing costs and more than tripling their top line. ACCESS Health has been part of a recent collaborative effort to address issues at the systems level. ACCESS Health supported donor organizations and international and national researchers on work devoted to universal health coverage, quality of care, preventive and primary care, and digital health. To this end, ACCESS Health is committed to carry forward its work on various recommendations for health systems improvement in collaboration with other research and implementation partners.